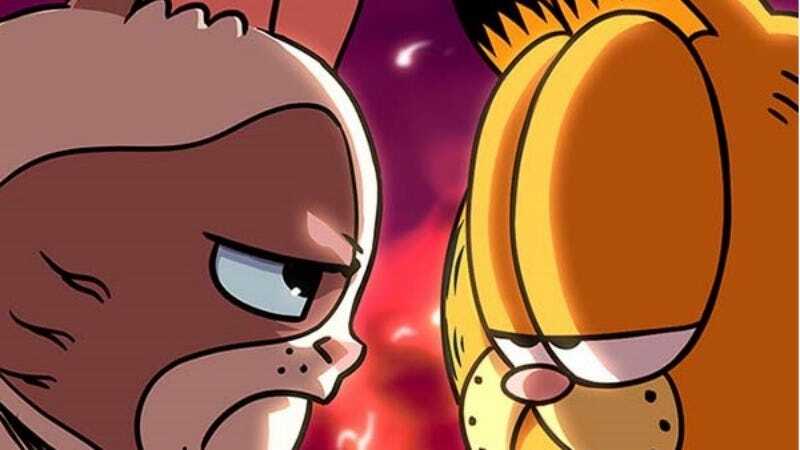 Grumpy Cat and Garfield are teaming up in their first comic book series. This seems like something that would grate my skin until it bleeds... but it might actually be one of the most logical crossovers in years. The limited comic series will pair the cat who hates Mondays with the cat who hates, well, everything. Sure, they’re both super-annoying cat characters (I don’t care if Tardar Sauce is real, she’s a caricature now), but they’re basically two sides of the same coin... with similar levels of success. Grumpy Cat, the meme that’s on everything from cell phone covers to Lifetime movies, is already the star of her own comic book series, The Misadventures of Grumpy Cat (and Pokey!). And, of course, Garfield started out as a comic strip, and has since launched into comic books, movies, and television shows. The latest comic is a partnership between KaBOOM! (part of BOOM! Studios) and Dynamite Entertainment, and BOOM! Studios founder Ross Richie said Garfield creator Jim Davis really pushed for the pairing. Grumpy Cat and Garfield’s comic is set to debut this summer. No word whether they’ll agree on what day of the week they hate the most.